A 39-year-old man who had had been completely paralyzed for four years was able to voluntarily control his leg muscles and take thousands of steps in a “robotic exoskeleton” device during five days of training — and for two weeks afterward — a team of UCLA scientists reports this week. In the latest study, the researchers treated Mark Pollock, who lost his sight in 1998 and later became the first blind man to race to the South Pole. In 2010, Pollock fell from a second-story window and suffered a spinal cord injury that left him paralyzed from the waist down. At UCLA, Pollock made substantial progress after receiving a few weeks of physical training without spinal stimulation and then just five days of spinal stimulation training in a one-week span, for about an hour a day. Even in the years since he lost his sight, Pollock has competed in ultra-endurance races across deserts, mountains and the polar ice caps. He also won silver and bronze medals in rowing at the Commonwealth Games and launched a motivational speaking business. “Stepping with the stimulation and having my heart rate increase, along with the awareness of my legs under me, was addictive. I wanted more,” he said. “It will be difficult to get people with complete paralysis to walk completely independently, but even if they don’t accomplish that, the fact they can assist themselves in walking will greatly improve their overall health and quality of life,” said V. Reggie Edgerton, senior author of the research and a UCLA distinguished professor of integrative biology and physiology, neurobiology and neurosurgery. 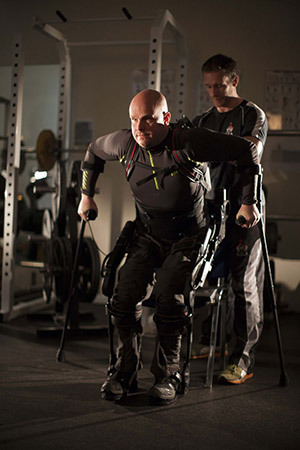 The procedure used a robotic device manufactured by Richmond, California-based Ekso Bionics which captures data that enables the research team to determine how much the subject is moving his own limbs, as opposed to being aided by the device. “If the robot does all the work, the subject becomes passive and the nervous system shuts down,” Edgerton said. The data showed that Pollock was actively flexing his left knee and raising his left leg and that during and after the electrical stimulation, he was able to voluntarily assist the robot during stepping; it wasn’t just the robotic device doing the work. Edgerton and his research team have received many awards and honors for their research, including Popular Mechanics’ 2011 Breakthrough Award. “Dr. Edgerton is a pioneer and we are encouraged by these findings to broaden our understanding of possible treatment options for paralysis,” said Peter Wilderotter, president and CEO of the Christopher and Dana Reeve Foundation, which helped fund the research. “Given the complexities of a spinal cord injury, there will be no one-size-fits-all cure but rather a combination of different interventions to achieve functional recovery. 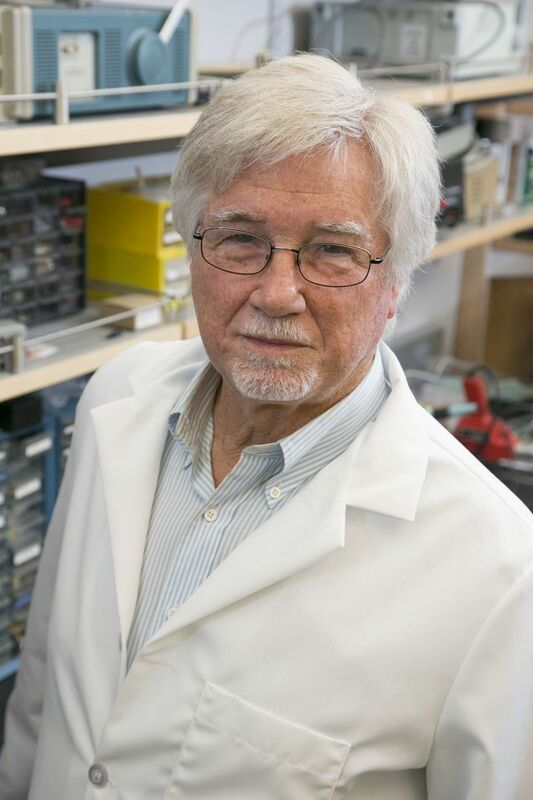 “What we are seeing right now in the field of spinal cord research is a surge of momentum with new directions and approaches to remind the spine of its potential even years after an injury,” he said. NeuroRecovery Technologies, a medical technology company Edgerton founded, designs and develops devices that help restore movement in patients with paralysis. The company provided the device used to stimulate the spinal cord in combination with the Ekso in this research. Edgerton said although it likely will be years before the new approaches are widely available, he now believes it is possible to significantly improve quality of life for patients with severe spinal cord injuries, and to help them recover multiple body functions. Although his laboratory is making dramatic progress, it only is able to work with a small number of patients due to limited resources. “We could accomplish a lot more in advancing the science and technology with more resources,” Edgerton said. The lead author of the new research is UCLA research scientist Parag Gad. Lead co-authors were Yury Gerasimenko, director of the laboratory of movement physiology at Russia’s Pavlov Institute and a researcher in the UCLA department of integrative biology and physiology; and Dr. Daniel Lu, associate professor of neurosurgery in UCLA’s David Geffen School of Medicine. Other key UCLA contributors were research technician Sharon Zdunowski, researchers Dimitry Sayenko and Roland Roy, research associate Piia Haakana and Amanda Turner, Edgerton’s laboratory coordinator. In addition to the Reeve foundation, the research was funded by the National Institutes of Health’s National Institute of Biomedical Imaging and Bioengineering (grants U01EB15521 and R01EB007615), the F. M. Kirby Foundation, the Walkabout Foundation, the Dana and Albert R. Broccoli Foundation, Ekso Bionics, NeuroRecovery Technologies and the Mark Pollock Trust. Almost 6 million Americans live with paralysis, including nearly 1.3 million with spinal cord injuries.